“Live longer or die faster.” With a gun to your head, what would you choose? If it sounds like a trick question, that’s because it is. “Do you think this is funny?” the man with the gun (Vasile Flutur) asks after the captured Alex (Stephen Friedrich) makes light of his dire situation. And, yeah, it kind of is. From the lovable loser romantic subplot to the at first anachronistic interrogation sequence, the understatement in Alex’s character is comedic. It is also quirky and unrealistic. Suspend your disbelief enough to allow for a distinct lack of realism, and you can enjoy Alex’s much more real idiosyncrasies. Director Phillip A. Ramos describes his film as a mixed genre: drama, comedy, romance. The comedy, as described, is clear. The romance—a strained relationship brought on by the insecurities of the protagonist and the eccentric occupation of his new flame (Theodora Woolley)—is clear. The drama is in the intersection point between the two. Elements of the crime thriller present themselves over time but as rough additions and not a natural gradation of the genre hybridity of the short. The Kidnapping of a Fish wants to be cheeky, morose, and high adrenaline at once, a concoction that wants to appear like salt, tequila, and lime but is executed more like a shot of whiskey in a pour of wine served in a snifter. In short, the tastes are simply not aligned. From moment one, the short feels like a mordant comedy, but one must readjust their expectations on the first meeting of Alex and Cassandra. Once it feels like a quirky rom-com, an additional readjustment must be made to account for the gritty crime elements. With each adjustment, the old way of thinking must fade away in order for the viewer to keep up with the changes. Comedy dissipates to make way for heartfelt romance which dissipates to make way for action which dissipates to make way for a reprise of romance. While these adjustments are certainly not difficult for the audience to make, it all feels very bumpy. This may be a fault of duration more than a fault of narration. 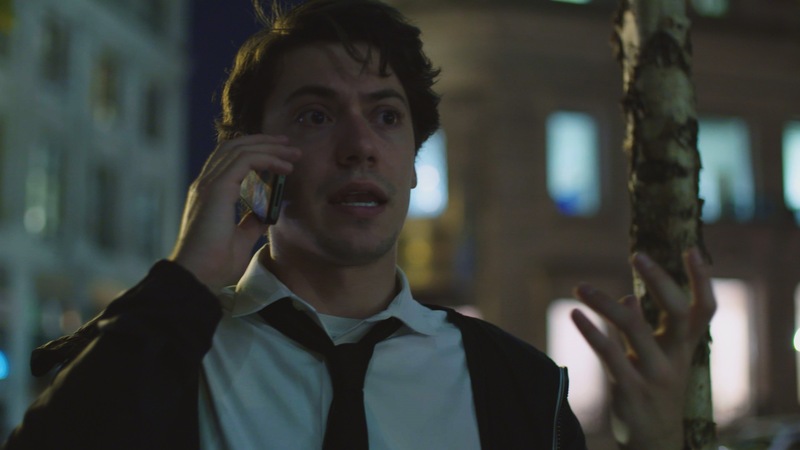 The desire to have a quirky action comedy vibe a la Kiss Kiss Bang Bang is evident, but a 25 minute short lacks the adequate space in which to flesh out each individual genre tone. As a result, what we get is a rough amalgamation of various and divergent narrative cues that string together only insofar as the characters change to accommodate for the disparity. Style, lighting, acting, and mise en scene are a foundation that the film needs to even begin to adhere to this rapidly changing tonal energy. The camera work and lighting changes make up for some of the jarring shifts, and the acting performance from Friedrich almost makes you forget about them altogether. Still, the distinct narrative fault lines that divide this short into what could be three completely different films make it hard to see the whole as anything cohesive.